The Execution Profiler records timing and execution statistics about instructions for the complete program code. To view the values in the Editor or Disassembly Window, use Show Time or Show Calls from the menu Debug — Execution Profiling. Hover with the mouse over a value to view the complete information in a tool-tip. Use the Outlining features of the editor to collapse source code lines. Single instruction statistics are summarized and displayed as one value for a code block. The Execution Profiler is available for the MDK-ARM toolchain only. You need a debugg adapter that supports instruction trace (ETM), such as ULINKpro. To enable tracing, follow the instructions on Configure Cortex-M Devices for Tracing. 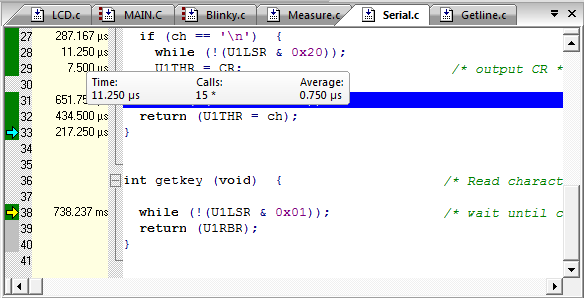 The execution time is based on the Core Clock setting when debugging on hardware. The execution time is calculated based on the current Xtal (MHz) clock setting when using the Simulator. When the code is executed multiple times using different execution clock values, incorrect statistics are generated. For further statistics refer to Disassembly Window, Code Coverage, and Performance Analyzer.